with the State of Georgia; or as visitors to any state park or state facility. and facility operators understand these basic requirements. designed or adapted with the widest range of users in mind. individuals with disabilities and promotes full participation and equal opportunity for everyone. are functional, safe, and accommodating, while still meeting the highest aesthetic standards. you as we build Georgia’s future for everyone. standards called the 2010 ADA Standards for Accessible Design (“2010 Standards” or “Standards”). meet their program accessibility requirements. 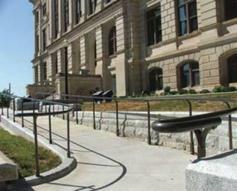 section on the ADA’s “program access” requirements applicable to state government. and the spirit of the law. Georgia State Financing and Investment Commission. 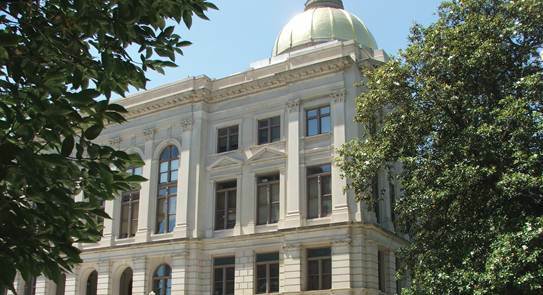 the accessibility of our built environment, a goal first established in our Georgia Accessibility Code. the Statewide Facilities Accessibility Project. requirements of our federal and state accessibility mandates, but how those mandates interrelate. attractions, and from our universities to our state parks. maintenance personnel in making appropriate and cost-effective decisions. Transportation, Housing and Urban Development, and others. Supplemental guidance is also available from the Access Board at www.access-board.gov. disabilities and all people living in or visiting our state. in its civil rights implications, particularly those reflected by the ADA. existing facilities, as well as state services and programs. it must meet ADA requirements. 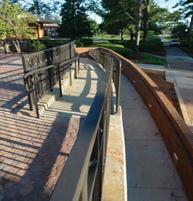 Access Board’s 2004 Architectural Barriers Act Accessibility Guidelines (2004 ABAAG). discriminate against persons with disabilities. that, when viewed in their entirety, its programs and activities are usable by persons with disabilities. published by HUD on March 6, 1991, are intended to define this minimum level of compliance. definition has a broad sweep. modifications to the place of employment. Title I is enforced by the United States Equal Employment Opportunity Commission. 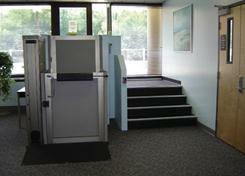 elevator or platform lift to an inaccessible level or story. activities may be at least indirectly affected by both Title II and III. those obligations. The State Department of Parks, a public entity, is subject to Title II. though the restaurant is not directly subject to Title II. obligation to meet the requirements of Title III. and that are carried out in an integrated setting. the restroom, food and drink, and travel information services provided. of facilities used to provide these services are accessible, under program accessibility requirements. the private entity acts in a way that is consistent with the state’s responsibilities. and alterations requirements, which must also be met for those facilities to which they apply. obviate its responsibility to comply with the law and regulations. reach ranges for accessible automated teller machines. DOJ elevator exceptions are as follows: ADA Title III Regulations 36.401(d), 1991 Standards 4.1.3(5), exception 1, 2010 Standards 206.2.3 Exception 1. For more information, see footnote 3 on page 18.
facilities. In late 2006, DOT also adopted 2004 ADAAG as its standards. means of egress will need to comply with the ICC’s International Building Code. reasonable accommodations requirements of the ADA for Title II entities at a later date. In the building code world, a single version of a code or standard generally applies to a facility. scoping provisions, it is less complicated to apply the correct provisions as of March 15, 2012.
accessibility provisions are indicated in parentheses). platform and vehicle floor coordination. Georgia Accessibility Code is applicable. state is not subject to . 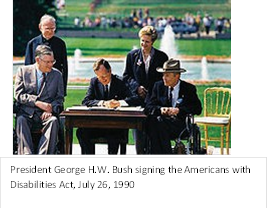 is subject to Title of the Americans with Disabilities Act. Answers can be found on page 62. Code (IBC) and ANSI A117.1, 2003.
practice to “go beyond” what is specified in the Georgia Code or the federal Standards. some situations. 2004 ADAAG and the 2010 Standards reduce the maximum height to 48 inches. lowered controls as a reasonable accommodation. ADAAG. Those provisions underwent numerous revisions before they were included in the 2004 ADAAG. they are included in the 2010 Standards. amplification system is provided [219.2]. percent of the residential units to be accessible. 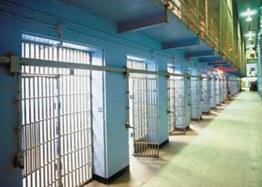 · Accessible bedrooms or cells must be provided in prison health care facilities [232.4]. construction and alterations that must be examined in conjunction with 2004 ADAAG. owners. 28 C.F.R. § 35.151(j). provisions about medical care facilities (§ 35.151(h)). 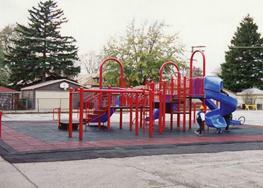 construction and alterations but also to existing facilities in which programs or activities are offered. security classifications and the opportunity for visitation with family member. applicable accessibility requirements but are unusable8 or dysfunctional for persons with disabilities. benefit from the programs or access the services offered there. run. Research indicates that over 40 percent of persons in a study using a manual wheelchair could not negotiate the resulting 30 foot incline. exam tables and golf cars to “talking” ATM’s and interactive kiosks. adopted by a federal standard-setting agency. (e.g., providing pedestrian signals in a roundabout). technical criteria they deem appropriate. meet other Title II requirements, including program accessibility. accessibility required by the standards/guidelines is maintained. This is not the case. mean incorporating building features that exceed the minimum requirements of the standards. in a building equipped with heavy entrance doors. state from having to make further access alterations to its facilities. curb ramps that permitted the use of truncated dome patterns that complied with the draft public right-of-way provisions. is maintained and remains unlocked. those required to be accessible - is more usable for everyone. practice” concept in our properties. The Georgia Accessibility Code, Section 120-3-20.08(8) requires all primary entrances to be accessible. must be accessible for people with communication impairments. · Has the team demonstrated proficiency in applying the Georgia Accessibility Code? accessibility and apply to the project? requirements than those in the state code? area such as a camp ground, or curb ramps in public rights of way)? minimum state or federal accessibility requirements in a facility design? accordance with the selection process in Section 50-22 of the Code of Georgia. may not bring to the table. the ICC/ANSI A117.1-2003 accessibility standard. with this in mind, and agencies are encouraged to look for the most accessible space available. examines or test products for compliance with the ICC/ANSI A117.1-2003 accessibility standard. state agency having enforcement authority. when it appears on a brochure or data sheet. Again, no agency regulates the use of this symbol. consensus safety standards and codes. information on this topic, please contact the State ADA Coordinator’s Office. an additional requirement of providing tactile characters, e.g., raised letters and Braille. six-dot cell, sometimes groups of letters (‘th’, ‘sh’, ‘st’) are replicated by a single six-dot Braille cell. best way to ensure that the state has actually purchased what was specified in the contract. once ordered and installed, cause violations when a facility is complete and occupied. computer screen at a state Visitors’ Center if he is blind and cannot see the screen? as supplemental guidance when IT services and equipment are procured by the State. 2004 ADAAG as developed by the Access Board. complaints once a facility is occupied. understand exactly what is required when different regulations address the same building elements. The following is a list of areas that may require particular attention during plan review. and that are constructed for state universities and many state-owned institutional facilities. Missing more restrictive federal requirements. the FHAA, the Uniform Federal Accessibility Standards and perhaps the Architectural Barriers Act. source for all federal accessibility mandates. Connecting facilities with all site arrival points. sidewalk or bus stop is remote from the building or structure. pedestrian route is being provided. A common error is applying the proscriptions against protruding objects only to accessible routes. or 10,000 square foot convention space. individually to determine whether it complies with the accessibility requirements. equipped with both a closer and a latch. · Not providing at least 18 inches at the latch side of a door that must be pulled open. 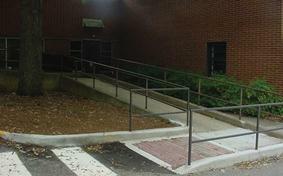 and length, curb ramps may not protrude into the access aisle. II. 2010 ADA Standards for State and Local Government. point at the walls and compartment opening. percent. The clustered locations are not permitted to provide inferior sight lines. The cluster exception is not included in the 2010 Standards. be different, the requirements of 28 CFR 35.151 will prevail. Accessibility Standards (UFAS), or the 2010 Standards. path of travel is disproportionate to the cost of the overall alteration. residential requirements (Section 233 and 809) of the 2010 Standards. basis. Different scoping and technical provisions will apply to the different building types. provide a least one wheelchair seating space. Title II entities that offer residential units for sale must now include accessible units. 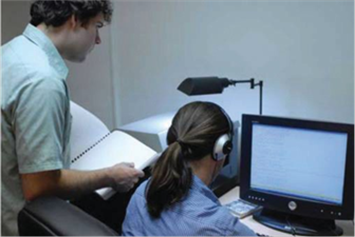 people with mobility impairments and 2 percent for people with hearing impairments. These cells must be dispersed throughout each classification level. patient rooms proportionate to the type of medical specialty. can be frustrated by errors that occur during construction. that connections like sidewalks maintain proper running and cross slopes. transfer from a car to a wheelchair. accessibility of the facility must be considered. specified products or cabinet sizes are not available. a violation of federal regulations. approved to ensure compliance with state and federal requirements. at the end of construction. This provision is replicated in the Georgia Accessibility Code at 120-3-20-.05(b). era, offer many enriching experiences for their visitors. At any given time, new construction constitutes a small percentage of the state’s building stock. environment that provides equal access to persons with disabilities. not to become protruding objects that are hazardous to people who are blind or have low vision. Walkways must be repaired and replaced when tree roots grow and heave or break the concrete. their location, should be provided wherever possible. they are available and operable when they are needed. physical plant. Do not permit vehicles to obstruct curb ramps, sidewalks or passenger loading zones. because they are more conveniently located. be affected and how the impact on building usability can be minimized prior to starting the work. maintaining or relocating accessible features throughout the project. 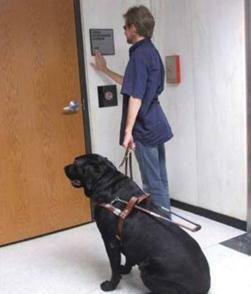 usability of the building or facility, or part thereof.” The ADA Standards impose similar requirements. The Georgia Code references the ICC 2006 International Building Code, Section 3403.1.
the building code may regulate a project. of a primary function area, a Title II entity must provide an accessible path of travel to the altered area. See language above in “DOJ Standards provisions not found in ADAAG,” under Section I of Chapter 3.
provide vertical access to the upper floors of the existing structure. 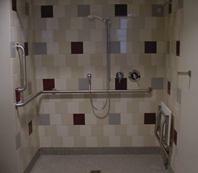 operates the Statewide ADA Facility Improvements Program. meet the letter and spirit of the ADA. program access for individuals with disabilities. Legislative Budget Office and Georgia State Financing and Investment Commission. 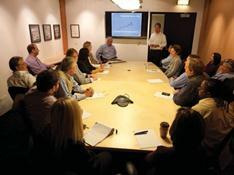 day-to-day operation of their properties and plan for future capital projects accordingly. 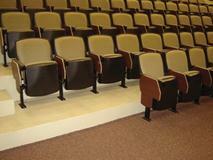 existing facilities under the program accessibility mandates of the ADA. upper stories of a building by elevator or lift. and concepts on which these provisions are based can be applied to any evacuation strategy. wheelchair or by using evacuation chairs. 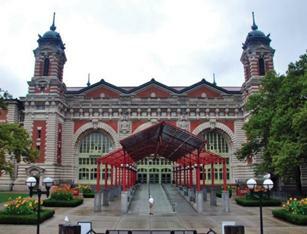 in barrier-free design while maintaining our centuries of heritage can be a challenge. · Steeper ramp slopes may be provided for very small rises in elevation. toilet facility may be sufficient. providing an alternative method of providing access. 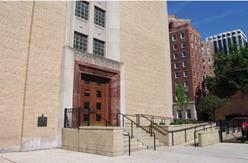 · In limited cases, secondary or service entrances may serve as the accessible entrance. program or service offered by that office or to ensure other means of making the services accessible. for people with mobility disabilities. available to everyone, including grandparents using walkers and school children using wheelchairs. including enforcement issues, is located here. providers, and State and local governments. regulations for Section 504 of the Rehabilitation Act of 1973.
regulations as well as information on reasonable accommodations, mediation and filing complaints. transportation facilities, as well as FTA compliance. 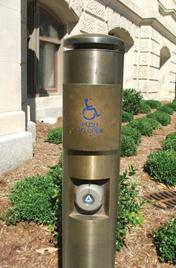 them, had not been updated to reflect changes in ADA regulations in 2010 and later. comparison of the text of the 2006 IBC, 2004 ADAAG, and DOJ requirements for accessibility. · Make sure accessible parking spaces are occupied only by eligible users. · Keep accessible parking access aisles clear. 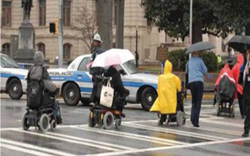 · Keep curb ramps clear of obstructions, e.g. snow, pooling water, etc. debris and abrupt level changes. into the required accessible route. · Maintain slip resistance of accessible routes at all times. 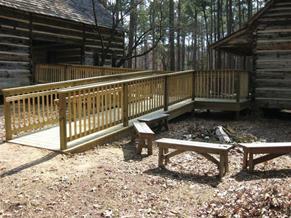 · Check structural strength of handrails and guardrails at stairs & ramps periodically. · Maintain circulation paths that are free of protruding objects. · Maintain clear headroom of at least 80 inches in all circulation paths. · Maintain accessible routes to stages and performing areas. 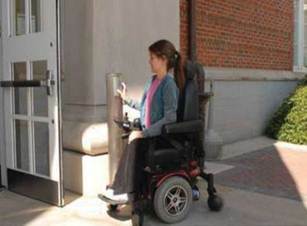 · Periodically check accessible doors for proper operating forces and closing speed. · Keep areas under call buttons free of obstructions. · Verify consistent voice-free operation of emergency communications devices. · Maintain automatic reopening devices in working order. 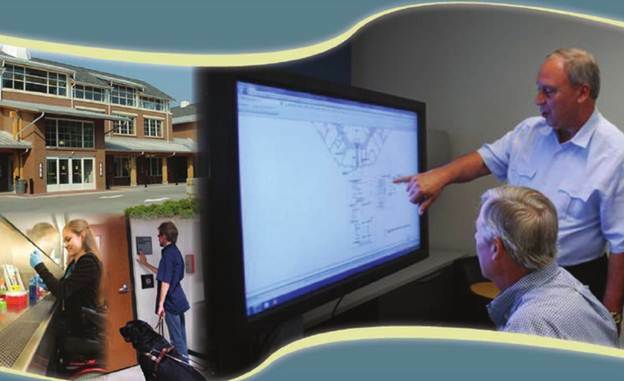 · Periodically check cab arrival notification systems and door closure timing. · Ensure that the cab floor and building floor are flush. · Keep coat hooks in accessible stalls in accessible locations. · Keep accessible toilet paper dispensers stocked and functional. · Keep accessible paper towel dispensers stocked and functional. · Keep all other accessible dispensers stocked and functional. · Maintain insulation on water supply and drain pipes under accessible lavatories. · Check structural strength of grab bars, tub and shower seats periodically.